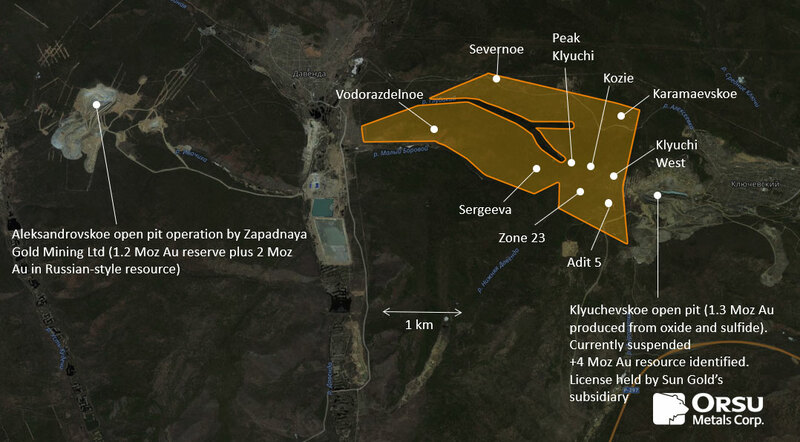 Orsu Metals Corporation (TSX-V: OSU) (“Orsu” or the “Company”) reports the strike length of drill-confirmed gold mineralization at Zone 23 extends to 300 m at its Sergeevskoe Gold Project in Russia. Orsu has now received assays for hole SDH17-20, which was drilled approximately 80 m west (Figure 2) of the previously reported hole SDH17-15 (see press release January 22, 2018) at Zone 23. The mineralization intercepted in this hole is principally similar in style and geological setting to that reported in SDH17-15. Selection of mineralized intervals, presented below, is based on a 0.5 g/t Au cut-off for compositing, with maximum 2 m length of 0.3-0.5 g/t Au mineralization included into mineralized interval. Composited intervals in drillholes are presented uncapped. SDH17-20 was drilled to a depth of 162.6 m southward at approximately 60 degrees. Hole SDH17-20 aimed to test the western extension of gold-mineralized stockwork to constrain its geometry in between historical holes C210 and C201, part of the drill fence also including historical holes C199, C200 and C202 (Figure 3). As expected, SDH17-20 intercepted multiple mineralized intervals (Table 1; Figure 3), corresponding to quartz-tourmaline veins and hydrothermal breccia. The most significant intercepts are: 0.76 g/t Au over 4.1 m from 45.9 m; 1.08 g/t Au over 8.3 m from 89.3 m (including 3.62 g/t Au over 1 m); 0.64 g/t Au over 4.8 m from 122.7 m.Better intercepts tend to occur near the contact between Permian granite and Jurassic granodiorite porphyry as well as near the hybrid porphyry dykes. Figure 2. Surface expression of multiple west-east-trending gold-mineralized intervals at Zone 23, Sergeevskoe Gold Project, constrained by historical and Orsu trench data. Table 1. Mineralized intercepts in drillhole SDH17-20 at Zone 23 (above 0.5 g/t Au cut-off). Figure 3. 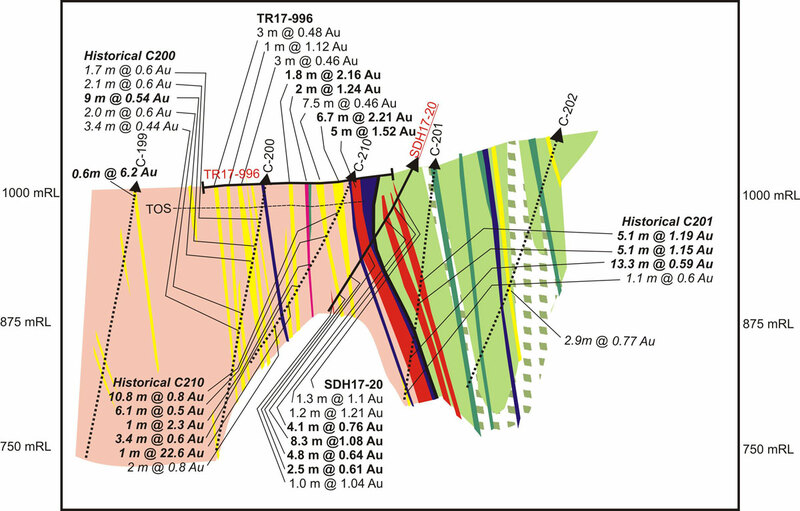 Gold mineralization in hole SDH17-20 and historical holes on cross-section 9220E (looking west). 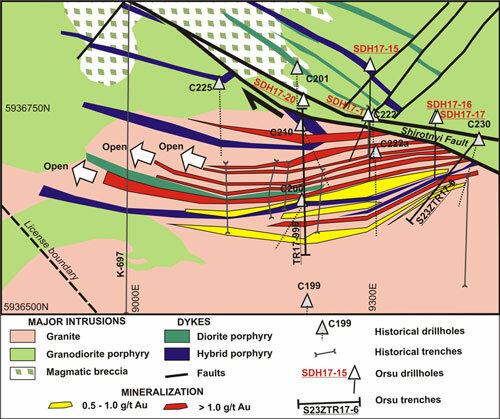 Note presence of multiple mineralized intervals in drillholes, with best mineralization occurring near the contact between Permian granite and Jurassic granodiorite porphyry. Higher grade in surface trench TR17-996 is likely to reflect enrichment in oxidized mineralization. TOS = inferred top of sulphide. Gold intercepts in historical drillholes are in Italics. For legend see Figure 2. The intercepts in hole SDH17-20 clearly demonstrate a western extension of gold mineralization in multiple subvertical veins rather than in, as was historically interpreted, widely spaced veins dipping to the north at some 60 degrees. Orsu noted that these intervals were also intercepted in historical hole C-225 in section 9140E. No historical drilling was undertaken further west at Zone 23. However, oxidized mineralization is present in historical trench K-697 in section 9000E (Figure 2) as confirmed by scout chip sampling by Orsu. This proves a drill-confirmed extent of mineralization for a total of 300 m, within a 420x170 m trench-constrained footprint of gold mineralization at Zone 23. The mineral system is limited to the north along the Shirotnyi fault that separates Permian granite, a principal host of gold mineralization, from less mineralized Jurassic granodiorite porphyry intrusion, remaining open to the west and potentially to the east. Drillcore samples were submitted directly to the ALS Limited laboratories in Chita, Russia, which are independent from Orsu, for sample preparation and analysis. Analysis for Au is performed using fire assay method with atomic absorption (“AA”) finish and with a gravimetric finish for samples exceeding 10 g/t Au. Results published are from the gravimetric finish if above 10 g/t Au and from the AA finish if lower than 10 g/t Au.